On Tuesday November 9th, PLEA reported on an incident where 400 precinct commander James Gallagher intentionally violated the MOU by telling an officer they couldn’t work out on their lunch break as specifically allowed for and enumerated in the contract. 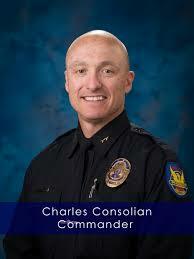 The involved officer contacted PLEA and ultimately elected to file a complaint. On December 1, the day after the complaint was filed, the officer was told by his Sgt. that he had been “randomly selected” to have his Taser’s entire history downloaded for inspection. Not only did this “random” inspection consist of a data download but recording all the external characteristics of the Taser to include removing and photographing the individual cartridges. It would be logical for anyone in this scenario to conclude they are being targeted for retaliation. Phone calls were made and the “random inspection” magically went away. Imagine for a moment, a scenario where an officer interacting with a citizen engaged in the same conduct eliciting a complaint. Does anyone for a moment think that investigators would tell the citizen “Well, I don’t know, this could open doors you might not be able to close, this could be a Pandora’s Box and we wouldn’t know where it would end up.” And, “I don’t want to sway your opinion, but hashing this out between you and the involved officer is probably your best recourse”? Of course not. The scenario just laid out would be vigorously investigated, and any officer, at a minimum, would be sustained on an unprofessional conduct violation. Yet, when a high level PD manager commits the violation it seems it is somehow OK to engage in what many would clearly see as intimidation tactics to discourage the involved officers from pursuing the matter any further. When it comes to managerial misconduct, the Phoenix PD way is to circle the wagons, deny, deflect, obfuscate and otherwise engage in what any logical person would see as intimidation tactics to discourage officers from reporting the misconduct. We have been told that PSB is looking into the matter. In an effort to give PSB an assist we will cite the relevant Operations Order related to Commander Consolian’s his conduct. Ops 3.18 Addendum A Section 3.A. enumerates those violations punishable by written reprimand. subsection 7 covers unprofessional conduct and and sub-section d. of sub-section 7 lists as a policy violation: verbal abuse/confrontation towards another employee. 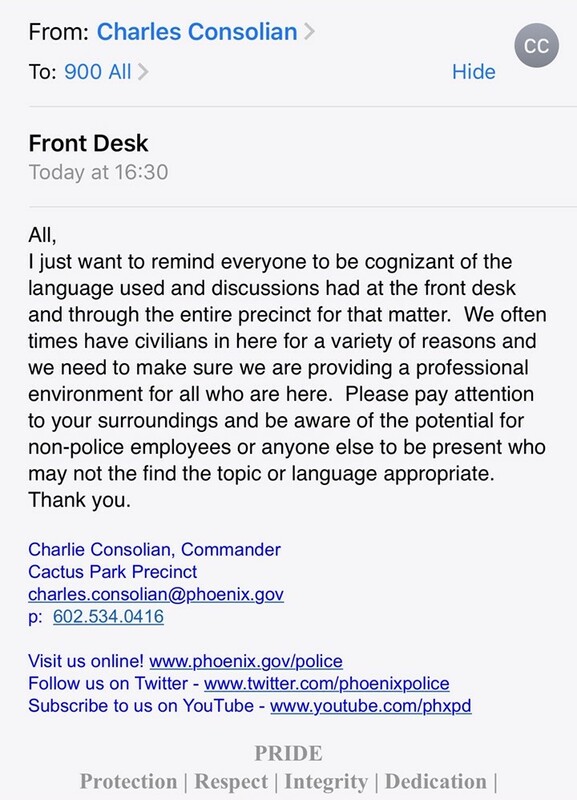 In what can only be seen as a very weak attempt at damage control, Commander Consolian sent out a precinct wide e-mail on December 6, 2018 that, in part, tells everyone to be “Cognizant of the language used and discussions had at the front desk and through the entire precinct for that matter.” Who could he have possibly been talking about? Charlie could have saved a lot of time by simply looking in the mirror and sending the e-mail to himself. Click Here to see the email. We will be watching to see how this turns out and will keep you posted.